This week, I spent an evening taking photos of London's sprawling brutalist playground, the Barbican. The idea of squaring its chaotic lines, KerPlunk perspectives and monolithic blocks of concrete and shadow felt like a fun challenge. 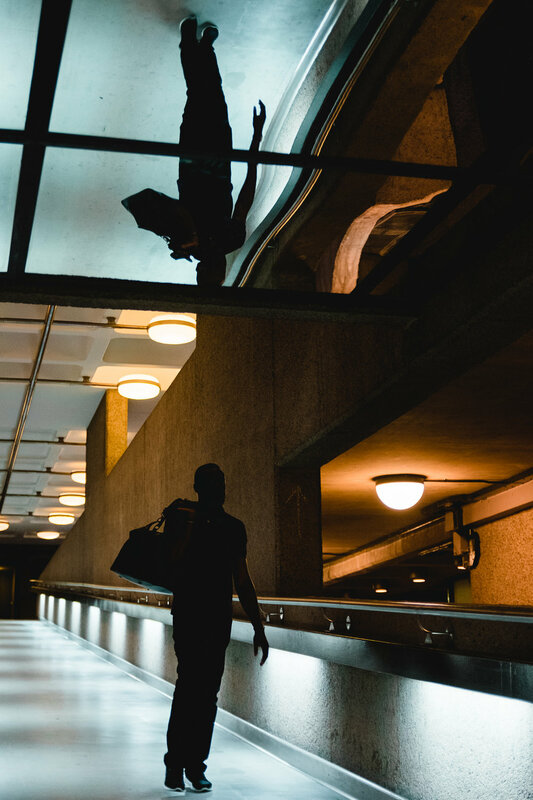 What follows is a series of photos from the evening, in chronological order, paired with a loose collection of thoughts about the location, the lighting and the gear. I've been shooting with the X100S for a few years now. Its low-light performance, exposed manual controls and comparatively light weight make the camera a pleasure to use. The lens, although sharp and fast, is 28mm. I've never loved the focal length. Tracking down the increasingly scarce teleconverter lens, which ups this to 35mm (50 equivalent), was a game changer. It negatively changes the weight and weight distribution, and the extra lens choice removes some of the simplicity of a fixed lens. However, it's the perfect lens for my stylistic preference, and a place like the Barbican with its authoritarian geometry demands a lens that submits to its jungle of straight lines. 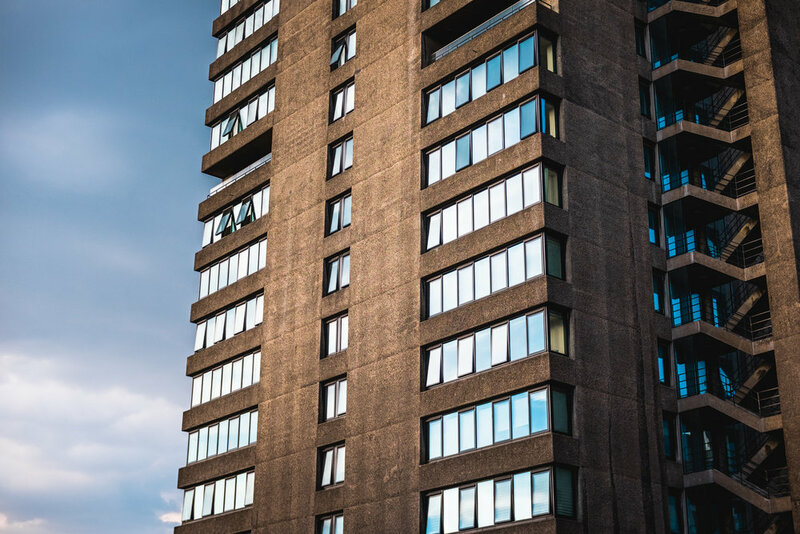 Brutalist architecture often takes small, functional units and repeats them to form larger, discrete sections. It results in swaths of pattern and the tighter crop of the teleconverter leans into this. The Barbican itself is so encompassing that it allows the deletion of the wider context without losing the actual sense of it. You can arrange and balance the remaining blocks and patterns within the frame in an almost abstract way. As someone who leans towards seeing and framing things in two dimensions, this is a playground for those bad habits. I actually have an intrinsic, primal dislike of brutalism. It flaunts its sheer mass and distributes it with top-heavy hostility towards nature and gravity. In cynical moments, I've felt that the crushingly low ceilings and disorientating dead ends, the pervasive sense of immovability and alien timelessness, are all an attempt at reinforcing the victory and dominance of the state over the individual. The crush of sky between two opposing buildings, archipelagos of sunburnt grass floating in a sea of brick, geometric water fountains. Nature's survival is designed. The evening light was promising. Sky suppressed by a crown of moody grey cloud, the setting sun piercing a clear horizon. I'd wanted to shoot against sky like this for some time. Buildings are lit brilliant sunset gold, but the stormy backdrop shunts them into the foreground. Unfortunately for most of the evening there was a slight haze smearing the arrow's path. It wasn't much, but it was enough to diffuse its energy. Concrete isn't an intrinsically beautiful material, but it will give back whatever it gets. Despite the slight washout, a crack of contrast still survived. I was carrying a couple of toys. I sat down on a grassy verge, one of the Barbican's small concessions of nature, and set out my playpen. One, the GorillaPod. It's a very portable, flexible tripod. The evening was sweltering, a six-week old 30 degrees, so I didn't fancy my normal tripod. As the X100S doesn't have an adjustable screen, framing the tower block was an uncomfortable game of trial and error. Two, a 10 stop ND filter. Combined with the X100S's inbuilt 3-stop filter, you can knock out an incredible amount of light, allowing long exposures in the bright of day. As I was fussing, swapping the teleconverter for the filter: Bang. The lingering haze lifted from the sun, the nitros were lit, and the tower block burned like a pyre. Combined with the reddish tint that often comes from "tint-free" filters, the concrete now gave back. I didn't have my cable release, and the longest programmed exposure the X100S allows is 30 seconds. Without a study tripod, the cable release would have introduced too much shake anyway. In these conditions I add a 10 second delay to the shutter, to let the camera settle down before exposure. The dark clouds generated a satisfying swirl behind the pin-sharp concrete torch, though perhaps a couple of minutes would have been cleaner. Filter off, I tried to capitalise on the haze's sabbatical. With light as good as this, fellow photographers all swirled round the Barbican like erratic moths to the concrete flame. I flapped my wings with them, and they led me through an unassuming gate into a rare sweeping courtyard. It was immediately obvious that the X100S, even without the teleconverter, would be too narrow to capture this. The iPhone has an excellent little lens for moments like this. It's wide, and in good lighting it makes an excellent, and worthy, counterpart to your main. It respected the panorama in a way that the X100S simply can't. The iPhone, while sharp, is easily blown. I try and expose for the brightest part of the scene and deal with the shadows later. Over the years I've jumped between different post workflows on my iPhone. Years ago, I'd spend too long on each in Snapseed, pushing them a little beyond the raw materials. Starting from scratch each time was consuming, and left them look inconsistent. VSCO has an excellent range of filters but recently I've settled on K3 for colour and B4 for black and white. K3 is reasonably close to my style in Lightroom, so usually I add that and push the sharpness up one. It also handles reds beautifully, emphasising the glow of the evening. 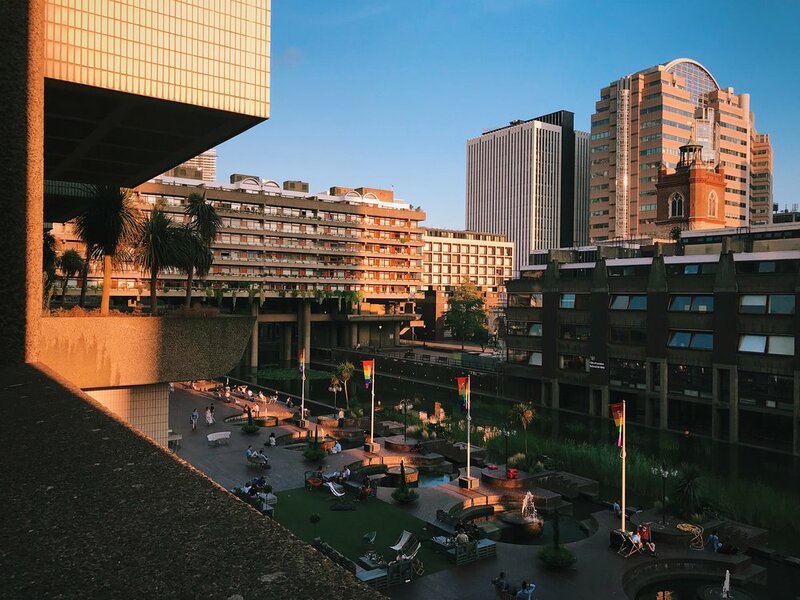 As the sun was allowed to set untempered, the Barbican began to positively glow. The shots look increasingly overprocessed but the scene itself just banged with contrast. It was a really terrific few minutes, and totally fed my light snobbery. When the final embers died, I went back inside. The guy in this photo had just wandered into frame and I found the opposing light as a counterpoint. The two create a nice tension, but the image is slightly out of focus. It was dark enough that autofocus was struggling, and I felt f2 was mandatory. The X100S has poor manual focus hinting, especially in low light with its small and dingy EVF. Coupled with the two subjects lying on different focus planes, this was an unlikely candidate for a crisp shot. Given a second chance I'd pump the ISO as high as 3200 to allow a narrower aperture (and thus a deeper depth of focus). Compositionally, I'm pleased that I noticed the light. Finding points like this is something I'm actively trying to get better at. The sun had retreated, and I decided to hang around for blue hour. But the X100S's low-torque battery had other ideas. No worries, I'll be back. I went home and had some peanut butter toast. It was pretty good thanks for asking.